Any Big Time Rush fans??? Any big Time Rush fans out there? Well, in our house it's the music of choice...Wyatt has been singing their songs since he got the Cd from Santa at Christmas. On August 7th we are going to see them in concert at the Lizard Fair at Dow Diamond. The boys are so excited...not to mention Ty is a great dancer to their music. It will be quite exciting! So, we spent last weekend in Chi-town with my Mom and Dad. I have been waiting to take the boys to the aquarium and field museum for so long. Chicago is one of my favorite places to go. I love the big city...I actually did my internship just outside of chicago. We stayed a few blocks from Navy Pier and a block from Michigan Avenue. We walk quite a bit and had lots of fun. 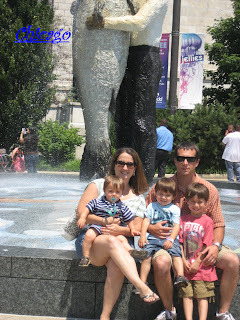 We did the Shedd Aquarium where Ty and Wyatt's favorite thing was the Jellyfish exhibit. My personal favorite was the Sharks, of course. Then we went to the Field Museum to see the dinosaurs...I think the biggest hit though was the Egyptian section of the museum. There were mummy's encased in their decorative 'boxes', when we turned the corner and there were more Wyatt yelled "They trapped another one!!!" Then when they had the 'crypts' with they actual mummy's in them Wyatt once again had to comment..."Look Mom, that one got away, watch out!" He was so funny! Ty was really interested in the actual facts about everything, which was fun to teach him things he didn't learn at school yet. Daddy found the geological rock exhibit the best...and I think Papa just liked to show the kids all the fun things they've never seen before. After the museums we walked down to RainForest Cafe for dinner...This was just as good as a museum if you've never eaten there... the boys loved it. From there I had work to do outside the City in Schaumburg...the boys spent a day and a half with daddy in a hotel...that was a long day and a half. There was a pool where Ty learned to swim underwater and do a flip underwater. He was very excited. We went to dinner at Medevial Times Castle, which is very fun with a bunch of boys!!! Horses and fighting, what's better than that? Levi's favorite part of the whole trip were the hotel rooms where he ran wild, never slept and found many fun spots to relax..
Next blog...Vacation Par II-Up North at the Cabin. We just spent the weekend in Chicago....crazy,fun and exhausting!!! More to come when we get back on Wed.